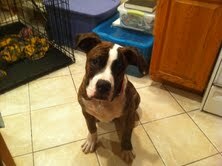 Congradulations to Chris and Yolonda w/American Bulldog(Rescue) on duccessfully completeing Obedience 1. We at Foster's Kennel are sorry to here that Rescueuddenly passed. RIP Rescue you will be missed. Commercial Leather is a Chicago based manufacturer offering wholesale pet products, leather collars, and leashes. Congratulations to Ms. Jackson and (Ziggy) for successfully completeing Foster's Kennel Obedience #1.